Great way to test our eight leading products PLUS our anti-aging Calming Cream! 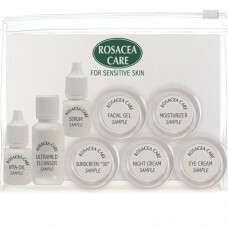 Rosacea Care is the most comprehensive skin care line in the world. It was developed specifically for those skin sensitivitites. Due to the variety and the different characteristics of our products we recommend that you test our Rosacea Care products before a full size is ordered. Ultra Mild Cleanser. The gentlest cleanser imaginable, with the soothing and protecting qualities of Shea Butter and Meadowfoam Oil. Very effective at removing makeup. Has a lovely natural non-irritating fragrance. This Cleanser is also an effective shampoo, and yet so mild that you no longer need worry about regular shampoos that can run down your face and irritate the skin. Paraben-free. Serum. Very rich in skin calming & soothing ingredients yet with a light consistency. Reduces visible redness while helping to normalize the skin and reduce the apearance of thin red facial lines. Also contains green tea and grapeseed extracts, which are potent anti-oxidants. It has been Rosacea Care bestseller for almost two decades! Paraben free..
Moisturizer. Richly moisturizing and calming, with Vitamin K and Willowherb Extract to reduce visible redness while soothing the skin. Delivers superb moisture and hydration to sensitive and irritated skin. L-Alpha Bisabolol and other chiral ingredients provide excellent skincare benefits as well as aid in the appearance of healthy skin. Protects skin against dryness and helps the skin retain its natural moisture. Paraben free. Night Cream. Richly moisturizing cream designed to soothe the skin and aid in calming dry or damaged areas through the night. Sea Buckthorn oil and Jojoba Seed Oil moisturize and nourish the skin while Willowherb reduces visible redness and sensitivities. Grapeseed extract & Pomegranate Extract protect against free-radical damage. Paraben free. Apply on clean skin over entire face with fingertips. Can also be used to touch up dry skin at any time. Facial Gel. An ideal moisturizing gel which provides just the right balance of ingredients for people whose skin tends to be a bit on the oily side. Apply morning and night to moisturize the skin. Excellent for use under cosmetics. Paraben free. Tinted ZincO SPF 20. Tinted ZincO offers broad-spectrum protection from both UVA and UVB rays. It is an excellent barrier cream that protects the ultra-sensitive epidermis from the elements. Especially helpful for those prone to flushing episodes. ZincO soothes the skin and helps reduce visible flushing. Tinted ZincO is flesh-colored, attractive and subtle it works for women and men. Especially effective in concealing visible facial redness and blemishes. This product was developed by a professional dermatologist. It is highly recommended for anyone who wishes to use a fine physical sunblock. Sunscreen "30". Our new All-Natural Sunscreen "30" contains 13.5% of Zinc Oxide, which provides broad spectrum protection from UVA and UVB exposure and also helps in calming irritated skin. Vita-Oil. A very light, soothing oil that deeply hydrates and moisturizes normal and the most sensitive and delicate skin. Contains esters of Vitamins A, C & D. Specially formulated for people with irritated skin to reduce visible redness, and people with severe dry skin. Vita-Oil does not occlude the skin or prevent medicated products from being absorbed. And it will not clog pores. Vita-Oil can also be useful for sensitive skin starting an anti-aging regimen. Calming Cream with SymCalmin®. An anti-aging cream in a luxurious moisturizing base. Please see individual products for the listing of ingredients. Start with the Ultra Mild Cleanser, followed by Moisturizer, Serum, and the remaining products until you have tried them all. Each item will last from 8 days to 2 weeks.